Joy Villa is at it again. 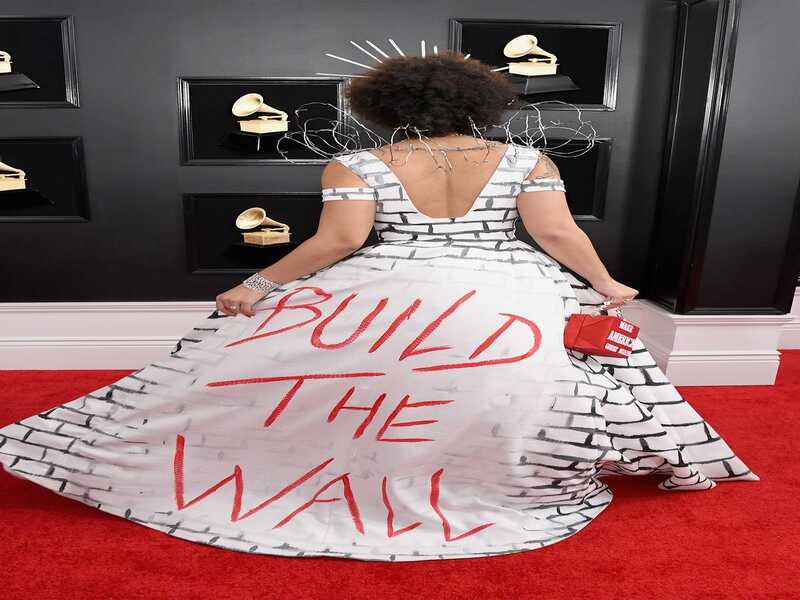 The headline-hungry singer (we’ve never heard any of her songs, either), has made the Grammys an annual tradition to express her unwavering support of President Donald Trump and a conservative agenda via her red carpet fashion. Back in 2017, she wore a blue “Make America Great Again”-emblazoned gown. She followed that up in 2018 with a white, anti-abortion frock by Pronovias featuring a hand-painted fetus enveloped by a rainbow, a “CHOOSE LIFE” handbag, and a tiara. For this year’s Grammys, she channeled… Trump’s much-debated-and-reviled border wall. No, really. From the front, the button-pusher was draped in silver, with barbed wire tufts on her shoulders and a similarly punitive-looking crown.. The back of the “dress” revealed a white brick pattern; Villa carried whatever her accessories are in a red “Make America Great” bag. If you’d like to help migrant parents and children separated at the Mexican border, here are a few resources.